Welcome to Dublin, where small town southern charm and a determination to keep Dublin-Laurens County "Green and Growing," have combined to create a community rich in character and full of life. The City of Dublin was incorporated by the Georgia Assembly on December 9, 1812 and made the county seat. It is said that a citizen, Jonathan Sawyer, named it Dublin after the capital of his Irish homeland. The city is situated at the junction of Interstate 16 and US Highway 441 and 319. It is about 2 hours away from the Atlanta airport and just an hour and 45minute drive from the beautiful city of Savannah. Dublin has a total area of 13.3 square miles of which, 0.1 square miles is water. Dublin's economy was based on cotton, soybean trades and corn which developed because it is the trading center with 5 railroads running into the city. Back in 2000, the city was known as 'City Of Excellence' by Trend Magazine and tagged as 'Signature Community' by Georgia Department of Community Affairs. Exactly the same reason why Dublin's people upheave that they are the only city in Georgia that's DOUBLIN' all the time. For those who love shopping, the city has 400 stores; including Dublin mall and an entire retail center with shops and restaurants. Then after a tiring day from shopping, one can relax, sip wine under the astonishingly gentle climate of the city or visit the newly renovated Theatre Dublin. 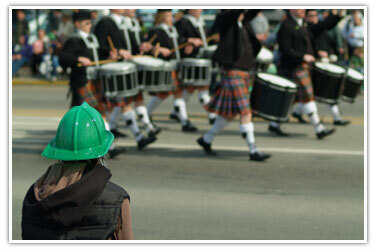 In March, the entire community is a "wee bit Irish" for the Dublin-Laurens St. Patrick's Festival, which has been in existence for over 30 years! The month-long celebration offers fun for the whole family with a parade, a road race, an arts and craft fair, a leprechaun contest and much more. Dublin and Laurens County, America's Junior Miss pageant is a scholarship competition held yearly for high school juniors. The winners of both the Dublin and Laurens County pageants advance to the state pageant. The Miss and Teen Outstanding Irish Capital Scholarship Pageant is an official Miss America preliminary pageant and held in the fall. The school Southwest Laurens Elementary has a Junior Miss Swle pageant each year. It is usually held in the spring. Whatever you need and whatever you want do there is always a place for everyone, where everything has a place. Experience the simple yet marvelous Emerald city called DUBLIN. The mission of Dublin City Schools, a diverse and dynamic chartered district with a rich heritage of excellence, is to create a compassionate, respectful environment ensuring success through exceptional educational opportunities, integrating individualized instruction with leading edge technology, consistent discipline, and a world class curriculum. For those wishing to take full advantage of all that Dublin-Laurens County has to offer year round, Southland Custom Homes specializes in Georgia new homes in the Dublin-Laurens County area. Southland Custom Homes is an on-your-lot custom home builder, meaning they build the home of your dreams in the location of your choice! With over 100 floorplan options to choose from and an array of top-of-the-line interior appointments, Southland Custom Homes is among the premier Home Builders in GA. In addition to providing a huge selection of plan options, Southland Custom Homes will even work with new homebuyers to alter a specific floorplan so that it is exactly what the buyer wants. If you are looking for a custom builder in Dublin-Laurens County, Southland Custom Homes is sure to meet and exceed your expectations. Southland Custom Homes, a custom home builder in Dublin, GA has model showrooms located in Macon (3956 Bloomfield Village Drive, Macon, GA 31206), Dawsonville (98 Bethel Drive, Dawsonville, GA 3053), and Marietta (265 N. Cobb PKWY, Marietta, GA 30062). Stop by or call us today at 1-866-56-BUILD* to see all that Southland has to offer!